Celiac.com 07/04/2013 - Summer is getting ready to give a sharp elbow to spring, and that means it's time to fire up the old grill and get some meat sizzling. 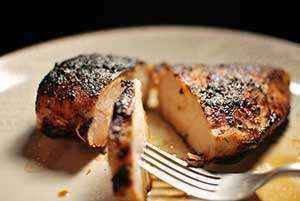 Chicken is one of my favorite things to do on the grill, and this tasty, easy to make, honey lemon chicken delivers big, rich flavor that is sure to please. I like to cook up a whole bunch at one time and pop the leftovers in the fridge for a lunch or picnic treat. This recipe works well for chicken breasts, and also makes a delicious kebab. Mix the lemon juice, olive oil, hot sauce, mustard, and lemon zest together in a large bowl. Add the chicken and toss to combine. Cover with plastic wrap and let marinate for at least 1 hour and up to overnight in the refrigerator. Before grilling, make sure chicken is at room temperature. Heat the grill to medium flame. Remove chicken from the marinade and pat dry. Dust chicken with onion powered, garlic powder, and lemon pepper. Place chicken on grill for 5 minutes on each side, then reduce heat to medium-low and close the lid of the grill. Cook another 20-25 minutes, until chicken is fully cooked. While the chicken cooks, melt butter, and whisk in the honey, lemon juice, BBQ sauce, zest, and mustard. Put some of the glaze into a small bowl for serving. Brush the tops of the chicken pieces with glaze, then turn the chicken over, and cook for 2 minutes. Brush other side of the chicken with glaze and turn it again. Cook for about 2 more minutes, until glaze sets up. Remove the chicken from grill, and serve with a small side of glaze. This recipes comes to us from Amber Lee. Heat ingredients in a saucepan. Whisk together 2T cornstarch + ¼ C cold water in a small bowl Add to cornstarch/water to saucepan. Boil 1 minute to thicken. Makes 2 cups. This recipe makes an outstanding gluten-free and vegetarian main dish that is very hearty! Ingredients: 1 cup sesame seeds 1 large bunch of fresh kale, finely chopped 2 tsp. olive oil 1/2 cup Vidallia onion, diced 2 cloves garlic, peeled and minced 1 Tbsp. dried thyme 1/4 tsp. chili powder 2 cups cooked quinoa (about 1 cup uncooked quinoa) 1 cup Greek plain yogurt 2 large eggs, lightly beaten ¾ tsp. sea salt ½ tsp. freshly ground white pepper Instructions: Preheat oven to 350 degrees F. Coat an 8 x 8-inch baking dish with cooking spray, then coat with sesame seeds. Fill a large bowl with ice and water; set aside. Bring a large pot of water to a boil. Add kale; blanch until bright green, approximately 8-10 seconds. Transfer hot spinach to the ice bath to cool for 30 seconds, remove and drain water. Set aside kale on a paper towel. Heat olive oil in a medium skillet. Add Vidallia onion, garlic, thyme and chili powder; sauté until translucent, approximately 8-10 minutes. Remove from heat; transfer to a medium-sized bowl. Add kale, cooked quinoa, yogurt, eggs, sea salt and pepper to the onion mixture; mix well to combine. Transfer quinoa mixture into the prepared baking dish and place in the oven. Bake until set and golden brown, approximately 60 minutes. Remove from oven. Slice and serve warm or at room temperature with a dollop of Greek plain yogurt for dipping, if desired. Enjoy! Want to make an easy romantic dinner that will fill the house with wonderful aromas? Try this recipe for steamed fresh lobster. Pour about 1 inch of water in the bottom of a large pot. Add all ingredients except lobster and butter. Bring to a boil. Add the salt and place a steamer insert inside the pot so that it is just above the water level. Put the lobster tails on the rack and cover the pot. Cover and steam for 8 minutes. Keep covered and do not lift the lid! While the lobster is steaming, set the table, pour a glass of white wine, and light a few candles. Serve with melted butter for dipping. Want to shock and delight the kids with a little Halloween culinary gore? These bloody baked rats are just the ticket! They are basically creatively shaped meatloaf with a twist. They're easy to make, and sure to draw some excitement at the dinner table. Heat the oven to 350 degrees F (175 degrees C). In a large bowl, combine the ground beef, onion, egg, crushed Rice Chex, paprika, celery salt, thyme, and pepper. Use your hands to mix until well blended. Measure out ⅓ cupfuls of the meat mixture and mold around a cube of cheese like a meatball. I like to put the cheese more toward the front and tell the kids it’s rats brains, but use your own judgement. Shape into a point at one end with a longer body that comes to an oval at the fat end. Place each ''rat'' into a shallow baking dish, and continue with the remaining meat. In a medium bowl, stir together the tomato sauce, sugar and Worcestershire sauce, and pour over the rats in the baking dish. Uncover the dish and continue to bake for another 5-10 minutes. Baste rats with sauce from time to time to form a glaze. Use a spatula to move each rat onto a plated bed of rice. Insert pieces of uncooked spaghetti into the rounded end of the rats to make tails. Press peas into the pointy end to make eyes. Use spaghetti pieces to anchor carrot or mushroom slices to make ears. Be careful to remove them, or to make sure no one eats them by accident, especially small children. Spoon tomato sauce over rats and serve over rice. This recipe comes from Angela O. via Allrecipes: Halloween Bloody Baked Rats. In addition to adapting it to be gluten-free, I have taken some liberties with spices, cut down the sugar, and substituted Swiss cheese for cheddar. Enjoy!